On 9/24/17 in “A sapsucking planthopper”, an account of the disgusting and destructive insect pest Lycorma deliculata, the spotted lanternfly, first recognized in Berks County PA (the Pa. Dutch land of my childhood). And now, in the 3/12/18 issue of The New Yorker, a horrifying, funny, deeply disgusting piece by Kathryn Schulz about Halyomorpha halys, the brown marmorated stink bug / stinkbug, the first specimens of which were collected in Allentown PA, also in Pa. Dutch country. Fresh entries in the carnival of godawful insect pest invasions: among them, the Japanese beetle (Popilia japonica) onslaught of my childhood; the Argentine ant (Linepithema humile) incursions here in California; and the RIFA, red imported fire ant (Solenopsis invicta), pestilence in the south and southwest. … From the annals of noxious pests, double-team division, a pairing of the disgusting and destructive insect pest Lycorma deliculata with the rampant invasive plant pest Ailanthus altissima. … The spotted lanternfly was first recognized in the US in Berks County, northwest of Philadelphia… On 22 September 2014, the Pennsylvania Department of Agriculture, and the Pennsylvania Game Commission, confirmed its presence. It is a threat to the state’s grape, fruit tree and logging industries. And now Kathryn Schulz’s March 12th New Yorker piece about an older threat: in print “Annals of Ecology: Home Invasion: Infitrating residences and decimating crops, the stinkbug keeps spreading”; on-line, “When Twenty-Six Thousand Stinkbugs Invade Your Home: These uniquely versatile bugs are decimating crops and infiltrating houses all across the country. Will we ever be able to get rid of them?”. Halyomorpha halys, also known as the brown marmorated stink bug (BMSB), is an insect in the family Pentatomidae that is native to China, Japan, the Koreas, and Taiwan. It was accidentally introduced into the United States, with the first specimen being collected in September 1998. 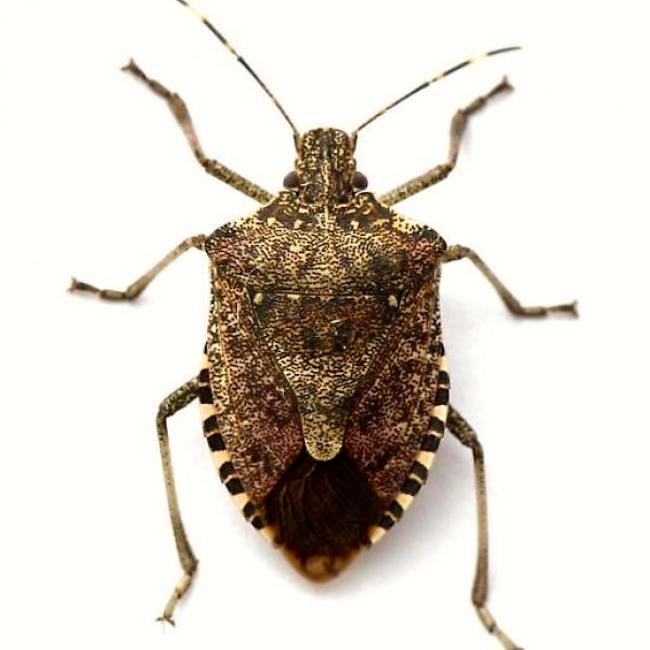 The brown marmorated stink bug is an agricultural pest and by 2010–11 had become a season-long pest in U.S. orchards. It has recently established itself also in Europe and South America. … The adults are approximately 1.7 cm (0.67 in) long and about as wide, forming the shield shape characteristic of other stink bugs. They are various shades of brown on both the top and undersides, with gray, off-white, black, copper, and bluish markings. The term marmorated means variegated or veined like marble. … The species is not native to this country, but in the years since it arrived it has spread to forty-three of the forty-eight continental United States, and — in patchwork, unpredictable, time-staggered ways — has overrun homes, gardens, and farms in one location after another. Four years before [Pam] Stone’s encounter [outside Landrum SC], a wildlife biologist in Maryland decided to count all the brown marmorated stinkbugs he killed in his own home; he stopped the experiment after six months and twenty-six thousand two hundred and five stinkbugs. Around the same time, entomologists documented thirty thousand stinkbugs living in a shed in Virginia no bigger than an outhouse, and four thousand in a container the size of a breadbox. In West Virginia, bank employees arrived at work one day to find an exterior wall of the building covered in an estimated million stinkbugs. … Slightly less noxious but vastly more pervasive [than the odor of skunks, wolverines, bombardier beetles, etc. ], the smell of the brown marmorated stinkbug is often likened to that of cilantro, chiefly because the same chemical is present in both. In reality, stinkbugs smell like cilantro only in the way that rancid cilantro-mutton stew smells like cilantro, which is to say, they do not. Pam Stone compared their actual smell to the ammonia-and-sulfur stench that suffuses the air outside paper mills. Others have likened it to everything from rotten fruit to filthy socks. A for effort. In fact, the smell produced by a stinkbug is dusty, fetid, lingering, and analogy-proof. A stinkbug smells, unhappily for us all, like a stinkbug. Along with cheap yoga pants, mass layoffs, and the recent surge in nationalism, the brown marmorated stinkbug is a product of globalization. It is native to East Asia — mainly China, Taiwan, Japan, and North and South Korea — where, kept in check by various natural predators, it has coexisted with the rest of nature in relative tranquillity for millions of years. But then, on September 21, 1998, a gentleman from Allentown, Pennsylvania, deposited several specimens of a mystery insect in the office of Karen Bernhard, an entomologist who works at Pennsylvania State University’s Extension Service. … Together with some colleagues, [Richard Hoebeke, an entomologist specializing in invasive species, who was then at Cornell and is now at the University of Georgia] began scouring records like those kept by Bernhard and eventually determined that the first verifiable specimen appeared in Allentown in 1996, most likely via a shipping pallet from China. It is … a generalist par excellence; entomologists call it “highly polyphagous,” meaning that it will eat a stunning range of things. For instance, [like the destructive pest the emerald ash borer, Agrilis planipennis, which also probably arrived with shipping pallets from China, it] will eat ash trees. But it will also eat birch trees, juniper trees, cherry trees, tulip trees, maple trees (fifteen different kinds, including sugar maples, big-leaf maples, and vine maples), buckeyes, dogwoods, horse chestnuts, black walnuts, myrtles, magnolias, willows, sycamores, hemlocks, elms, and oaks. That is just a sampling, of just the trees. In other domains, it will eat a lot of things you probably eat, too: broccoli, asparagus, tomatoes, eggplants, okra, chard, cabbage, collards, bell peppers, cucumbers. It will eat pecans and hazelnuts. It will eat hops and grapes. It will eat apples and pears, raspberries and blackberries, apricots and peaches and nectarines. It will eat, like a medieval princeling, figs and quinces. It will eat, without apparent discomfort, horseradish and cayenne pepper, habaneros and jalapeños. This entry was posted on April 22, 2018 at 3:00 pm and is filed under Holidays, Language and animals, Names. You can follow any responses to this entry through the RSS 2.0 feed. You can leave a response, or trackback from your own site.